In our 87’ x 64’ space, the new Allegheny & Western will be double track railroad representing selected scenes from the area ranging westward from Jersey City, NJ to Harrisburg, PA with single track branches to Wilkes-Barre, PA and Maybrook, NY. 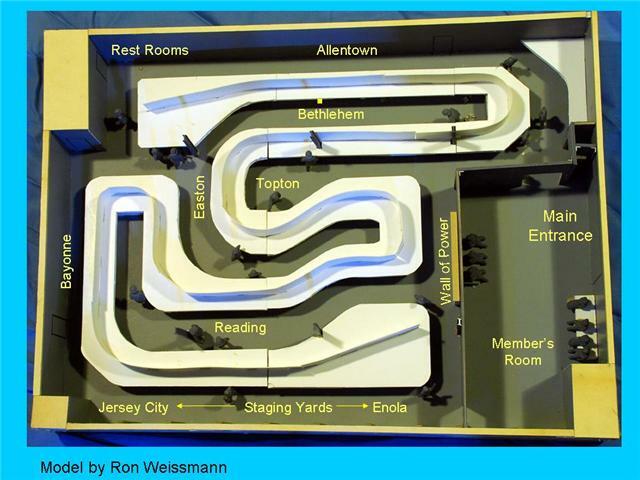 The layout’s theme is based on prototype aspects selected from the Lehigh Valley, Central Railroad of New Jersey, Reading, Pennsylvania, Lehigh & Hudson River and Long Island railroads. 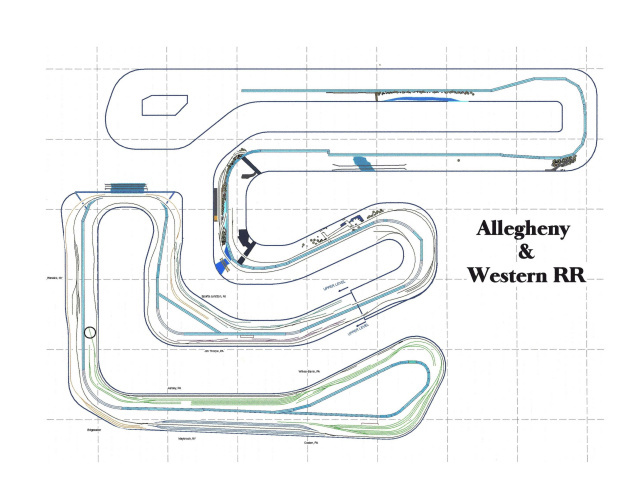 The hub of the railroad will be Allentown, PA, consisting of a large freight yard with an operational hump for freight car classification, an engine terminal and a passenger station. 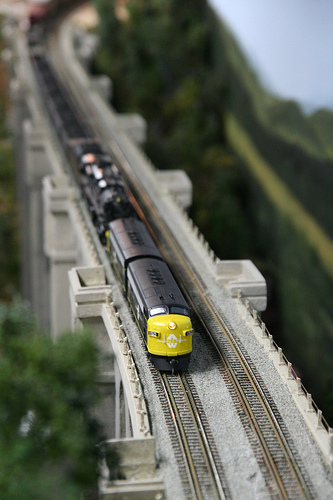 The main line will be 640 feet long (10.5 scale miles). Secondary yards will be located at Reading, PA and Plainfield, NJ, each serving the surrounding industries. Approximately half of the layout will be dual-level. The Jersey City to Harrisburg Main Line will occupy the lower level. This will include the steel-making complex at Bethlehem, PA. The Wilkes-Barre and Maybrook branches will occupy the upper level. A major coal operation including three mines, a large coal breaker and a marshaling yard will be located at Wilkes-Barre. The Maybrook Branch will include an interchange with the New York, Susquehanna & Western Railroad at Sparta Junction. Also featured will be two carfloat operations based on Long Island City and the Bronx in New York City. Operations will be supported by a 20-track staging yard on the lower level and an 8-track one on the upper. Scenic highlights are to include a 550 ft. long, 100 ft. high double track concrete viaduct modeled after the Tunkhannok Viaduct in NiIcholson, PA; the Lehigh River gorge near Jim Thorpe, PA and side-by-side lift and bascule bridges spanning Newark Bay, NJ. There will be over 450 turnouts, all remote-controlled. A prototypical signal system will govern train movements via a computer-based graphical control system with multiple dispatcher screens. 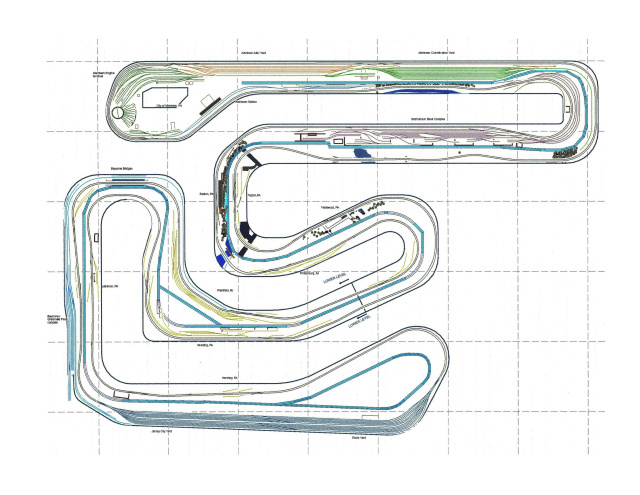 The image to your right, shows a schematic track diagram of the prototypical operating concept of the new layout. The old A&W depicted the western lines of the railroad. 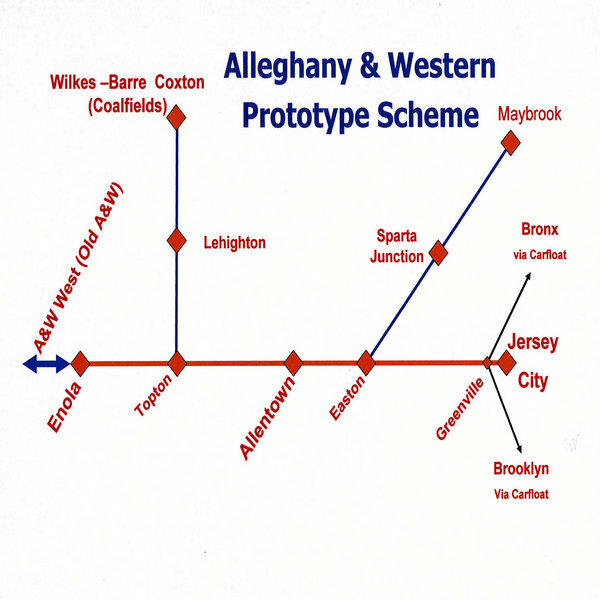 The new version depicts the eastern portion, beginning at Enola (Harrisburg) with the main line running east to the New York Metro area, and its two carfloat connections. Branches will diverge north to the coal region of Pennsylvania, and the New England gateway of Maybrook. The model to your left, is a Quarter inch to the foot model constructed by member Ron Weismann, to aid in the design of the layout in our new space. The image to your right, is the design of the lower level of our layout. The image to your left, is the design of the upper level of our layout.